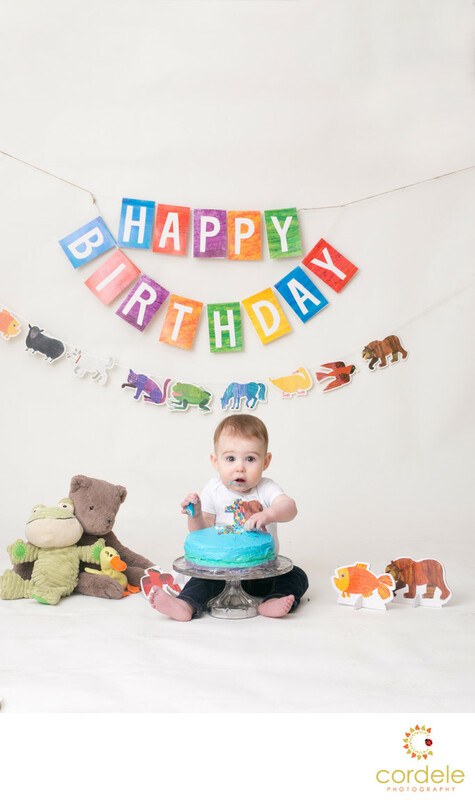 Brown Bear theme for a Cake Smash in Boston is here! This was a clients idea and this example is just too much! How do I come up with Cake Smash themes? A lot of the time, I look around my children's room and I find inspiration. This theme the client actually came up with and I was thrilled with the idea. I've said before, you don't want too many props as you can overwhelm a child at a session. You want just enough accents to give a feel and then the portrait and cake smash will all pull itself together. What I love about the different themes is that it gives parents the chance to really incorporate their child's personality into the photo. You are not stuck with just a white seamless background, you can have purple or pink or blue! I typically tell people to book these at least 3 weeks out so I can order the correct props. If you can't think of a theme, that's okay! That's what the photographer is for! I'll ask you a series of questions and then you can pick from a list of ideas I come up with. It's that easy! Location: 40 Marla Lane Reading MA.